A fast, reliable website backup service that gives customers peace of mind. Give clients a self service solution for recovering from accidental deletions and file overwrites. Mistakes happen. One-click restore saves you time and heartache by getting your site back to where it was before the issue occurred. Built-in WordPress support includes automated updates, WordPress plugin and auto-recovery on update failure. With CodeGuard, your customers have an independent off-site backup that they can access at any time. Customers pay only for the amount of backup storage disk space they require. Every backup is timestamped allowing customers to rollback their site on-demand to any point in time. 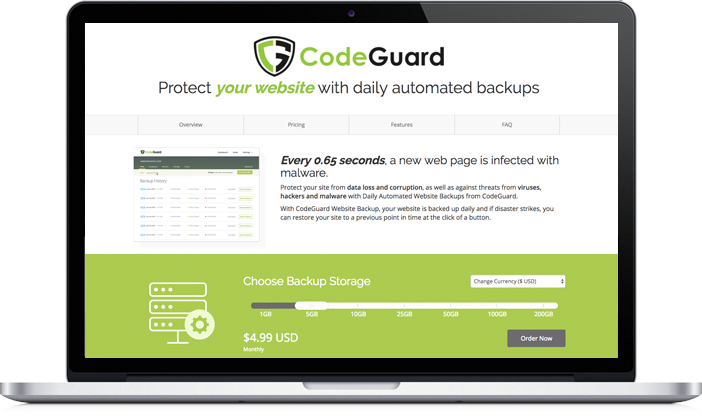 CodeGuard monitors your customers websites for changes and alerts users to changes that occur. CodeGuard stores backups on Amazon S3 for rock solid reliability and durability, protected with AES-256 server-side encryption. Start selling CodeGuard in 60 seconds!